Since June 2018 Vizagites came to know through the newspapers that a Rs. 100 crore project was being considered on the beach road near the Kursura submarine. The proponents of the project were said to be VMRDA, GVMC, Tourism and the Navy. While the first three were putting in funds, the Navy was contributing a Sea Harrier aircraft. The components of the project were envisaged as a naval museum comprising the existing Kursura submarine, TU 142 aircraft museum and the Victory at Sea memorial plus an added decommissioned Sea Harrier aircraft an underground tunnel of 900 meters and an underground car park for more that a 1,000 cars and 1,000 bikes. Please note that the tunnel component had now been dropped by VMRDA. This project is highly controversial for several reasons, with the public and the administration taking opposing views on the need to thrust this project into an already crowded beach road. 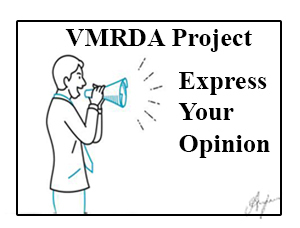 To get an understanding of your views we are conducting a quick survey. We request you to take a few moments to fill the questionnaire and also share it with your friends. When local projects are taken up, whose opinion should be most important? (స్థానిక ప్రాజెక్టులు చేపట్టినప్పుడు, ఎవరి అభిప్రాయం చాలా ముఖ్యమైనదిగా ఉండాలి? The recent brazen murder of a prominent business man in broad daylight in Vizag has shocked the citizens of Vizag and has many of them worried about their safety. Do you think Vizag is no more a safe and peaceful city? The Coastal Regulation Zone Activists Bogey? The recent complaint by Andhra Pradesh Tourism Development Corporation(APTDC) Executive Director that execution of tourism projects in the city delayed because of "activists" sounds like a big fat excuse, a diversion! It will be interesting to know which body has objected and which beach shack has been stopped and how much tourist business has been lost because of those shacks not coming up. The ministry of Environment and Forests (MOEF) have observed how irresponsible tourism and other industry can ruin our best natural assets. Later crores of our money will be required to clean up. We will be left with garbage and plastic strewn beaches. Tourism department will simply wipe their hands off saying "cleaning and managing the beach is not our problem". Government officials must focus on the task of getting the basic tourism infrastructure in place like proper approach roads, resting areas, parking, brochures, guides, toilets, high quality sanitation and greening. Do you think as stated by APTDC is it really the Coastal Regulation Zone(CRZ) Activists Bogey? Election of corporators and Mayor of Visakhapatnam is pending since 2012 and the State Goverment seems to be in no hurry to conduct the same. Various reasons have been cited including problems related to merger of Anakapalle and Bhimunipatnam municipalities with Greater Visakhapatnam Municipal Corporation, court cases, and the Hudhud cyclone. It appears that not having anyone oversee the functioning of the civic body suits the state government. There are also allegations that taxes and other fees collected from Vizag are being diverted for the development of the proposed State Capital for the last four years. Is the absence of elected representatives affecting the effective functioning of the civic body in Visakhapatnam?